If you’ve landed on this page, chances are, you are thinking about visiting Saint James. Below is lots of information to make your first time with us more enjoyable. Where is Saint James located? The campus of Saint James is located at 119 N Duke St, Lancaster, PA 17602. Download the campus map here. Where can I park when I come to Saint James? Saturday 5:00 PM service: Parking is free on Saturdays after 4 PM in our block of Duke and Orange Streets. This is a courtesy extended to Saint James by the Lancaster Parking Authority; there is no enforcement of parking regulations after 4 PM. In addition to street parking near the church, the Duke Street Parking Garage is at the end of our block on the corner of Duke and Chestnut. You will need to pay to use the garage on Saturday evenings. Sunday mornings: Parking is free on downtown streets, and there is also free parking until noon available to parishioners in the Duke Street Parking Garage located at the end of our block on the corner of Duke and Chestnut. You must enter and leave the garage before 12 noon. While you will need to take a ticket for the bar to be raised and enter the garage, you will not need to pay upon exit. Simply say that you were at Saint James. Where are the handicap accessible entrances? We have several handicapped accessible entrances on campus. Parish House: There is a handicapped accessible entrance at the rear of the building, accessible from Cherry Street. Church: There are two handicapped accessible entrances. One is located just outside the Chapel. The other is located off of the cloister and leads into the narthex. Parish House: Restrooms are available on the first and second floors. Church: Restrooms are located on the lower level of the church. They are accessible via the Narthex elevator or the steps next to the Chapel. Download the campus map here. We offer many opportunities for worship on the weekend. Our Saturday night 5 PM mass features a broad array of live music woven into the traditional Episcopal liturgy. This service is streamed live and is usually an hour long. The 8:30 AM Sunday Mass is more traditional with a few hymns, shorter sermon and Holy Communion—great for early risers and lasts about an hour! Our largest service of worship, the 10:30 AM Mass, celebrates Holy Communion with a full choir (during the school year), hymns and traditional liturgy. Children are invited to join children’s Chapel during this service, and nursery care is available for children up to the age of four. This service is streamed live and can be over an hour. On Sunday evenings at 5 PM, we offer a Contemplative mass that meets in the Saint James Chapel and offers a worship experience in silence, stillness and reflection. The service also features a different theme from mystics and saints to movement, prayer and a spiritual practice. Music, meditation and a hint of incense are also an integral part of this intimate celebration of the Lord’s Supper. Do I need to be a member to participate in the Eucharist? receive, we invite you to come forward for a blessing if you desire. The order of service is taken from The Book of Common Prayer available in the pew racks. Everything you need for the service— including the liturgy, hymns and announcements—is provided in the service bulletin distributed by our ushers. Where is the Forum Room? The Forum Room, where we congregate for food, faith and fellowship, is in the Parish House two doors north from the Church. Enter the front door and walk straight back past the restrooms and the nursery. Do you have children's programming on Sunday? Each Sunday during the school year, Saint James offers the Godly Play curriculum of spiritual practice for young children in kindergarten through grade 5 that encourages them to nurture their beliefs and faith through wonder and play. Learn more about Godly Play at Saint James here. Middle and high schoolers also meet at 9:30 to explore a variety of topics related to their growing spirituality. To learn more about programs for youth, click here. Not sure what is a good fit for your child? For more information, email Alyssa Pasternak Post, Director for Children, Youth and Family Ministries. Children ages 4 through 5th grade begin the service in the Sanctuary where they can experience the processional and the opening congregational prayers with their family. After the opening Collect, children are invited to the front of the Sanctuary to make their way to the Chapel and participate in songs, prayers, brief meditation and storytelling of the day’s Gospel and/or New and Old Testament readings. A children’s shelf located in the Narthex offers items that may aid your child’s worship experience during the remainder of the Mass. Crayons, religious books, finger labyrinths and other items are available for your child’s use. Please return the items to the shelf at the end of the service. The nursery is located in the Parish House and is a large room equipped with age-appropriate toys, books and learning materials. We have a paid nursery staff of six regular workers who work in pairs and rotate weeks along with 3 substitute nursery workers. All workers maintain state and diocesan clearances. A family restroom with a changing table is located inside of the nursery. Our experienced caregivers are committed to providing a safe, clean, loving, and playful environment. Nursery care is available for infants through age four during the Sunday 9:30 AM Adult Forum hour and the 10:30 AM Mass from September through May. During the summer months, the nursery is open during the 10:30 AM Mass only. Visit our nursery FAQ page to learn more about our nursery procedures. How do people dress for worship? We encourage everyone to be comfortable and to wear what they want to worship services. You’ll see quite a bit of variety from suits and dresses to jeans and t-shirts, even shorts and flip flops in the summer. People dress perhaps more casually for the Saturday evening and Sunday evening contemplative services. For all our services, we say come as you are! Are the church grounds and cemetery open to the public? Our historic church yard is open to the public during the daytime seven days a week. 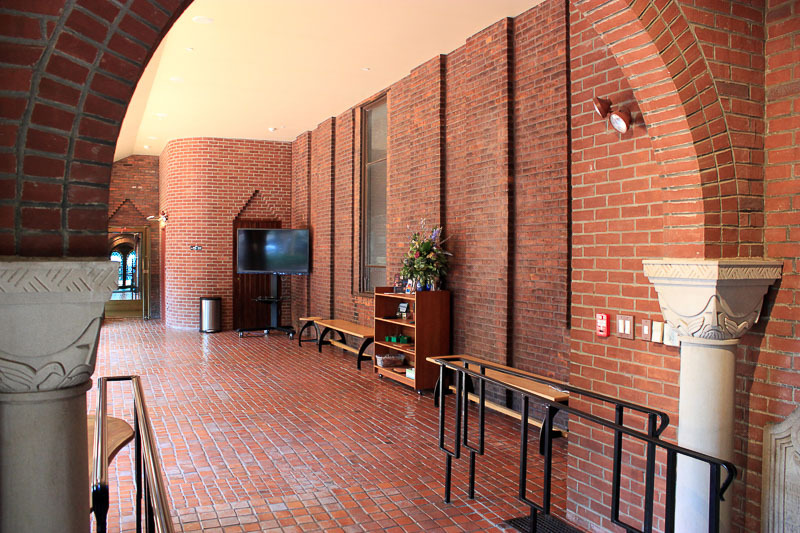 The Narthex at Saint James is off of the Duke Street entrance. Click here to learn more about our streamed services.